I've always fancied owning a Stormtrooper costume. There! I've said it. It's finally good to get that off my chest. In the past I owned a Don Post Stormtrooper helmet, but always fancied having a fibreglass helmet and costume, but at 46, I'm a little too old (not to mention fat) to indulge in such nonsense. There's also the fact that there are way more important things to spend money on. Having said that, I did recently give into the Dark Side and preorder the new Hasbro Star Wars: The Black Series Imperial Stormtrooper Electronic Voice Changer Helmet. 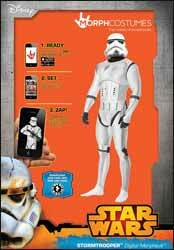 Morphcostumes new Stormtrooper Digital Morphsuit retails at around £45. For that you get a Polyester/Spandex Lycra blend one-piece suit with highly detailed Stormtrooper armour printed on it. I was pretty impressed that the back is just as authentically detailed as the front. It also comes with a cloth-based helmet that fits snuggly over your head. As this is stuffed into the same thin package as the body costume, the headpiece is a little misshapen when you first get it out. But if you wear it for a while and leave it out, then it soon takes a more realistic shape. In addition, when not wearing it, the body suit can be rolled up and placed inside the helmet. The costume is well made and great value for money, but MorphCostumes go that extra mile by making this interactive. The right hand of the costume has a patch attached. All you need to do is download a free app and select the Zappar section. Give your phone to a friend and tell them to stand back a few feet and zap the code. You can then strike your best Stormtrooper pose and blast away. I'm over 6ft 4in in height, and if I had one complaint, it's that the black neck material could have done with being a little longer and the helmet could have been a little longer also, as my chin(s) could clearly be seen poking out from under the helmet and and my neck was also visible. One way to fix this is to either wear a high collared T-shirt underneath, or you can actually buy a rubber Stormtrooper neck piece (designed for fibreglass costumes). As the costume is designed to be figure hugging, it obviously helps if you have a good physique. I don't, and would need to lose quite a bit of weight before I'd be comfortable wearing it in public. I really can't champion these costumes enough. They are incredible value for money. If you're at all body conscious then obviously these are probably not for you. 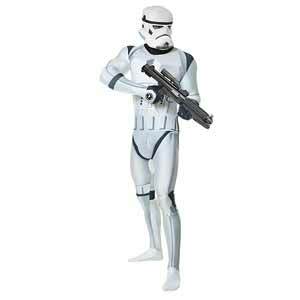 But if you're looking for a cheap but very effective Stormtrooper costume, you'll totally have a blast with this.